NB The standard changeover day at Penamont is a Thursday. We do allow short breaks at all but the busiest times - just ask. Please be aware that for short breaks and non standard start days, the pro rata price displayed on this website will not be correct. Please just contact us for pricing. Modern, large and comfortably equipped 5 bedroom house with a spacious and very stylish feel. 2012 complete refurbishment with the highest quality fittings, beautiful interior design and painted floorboards throughout. Large and fully enclosed rear garden with big terrace area. Located behind Trevose at Constantine – perfect for easy access to Trevose Golf Course and its facilities and under 15 minutes walk to Constantine beach. Penamont has been completely revamped at the beginning of 2012 – new furniture, new exterior, re-paint throughout, new shower room, new electrics, new heating and hot water, new cooker! New for 2013 – games room in the garden, with pool table, TV and bean bags – get some peace and quiet in the house! Raintree House Holidays is a small beach house letting and management company focusing on a handful of beaches down the coast between Padstow and Porthcothan. All our houses are within walking distance to one of these beautiful beaches and a large number have spectacular sea views. We let our owner’s holiday homes out to guests many of whom we have known for years. Holidays with Raintree will always be memorable and enjoyable as we manage all aspects of the houses ourselves. We employ our own cleaning and maintenance teams, this means we are very flexible and can achieve very high standards across all our houses. The modern family bathroom is next to the single bedroom equipped with bath and shower. The master bedroom ensuite is spacious and equipped with bath and separate shower cubicle. There is also a separate cloakroom with wash basin and loo. The large sitting room is to the left from the hall. A lovely light room, dominated by the huge picture window to the front. A large L shaped super-comfy sofa defines the room, funky furnishings. A large flat screen is positioned over the fireplace. The kitchen/diner via double glass doors from the Lounge or from the hall has a modern range cooker, good quality table and cookware. Fridge/freezer, Washer/Dryer, separate fridge, Dishwasher and Microwave. Trevose Golf and Country Club is minutes walk along the road - perfect for golf, tennis and swimming. Notes on accommodation: We welcome well behaved dog(s). Outside: There is a large lawned area at both the front and back of Penamont. The rear garden is fully enclosed and safe for children and dogs. There is plenty of room for ball games or to just relax. There is a barbeque outside the French windows. The garage is accessible through a gate at the back of the garden or on the drive round the side of the property. The garden furniture is stored here and is available for use by guests. For 2013/2014 the garage is now equipped as a great playroom for kids (or big kids!) with pool table, table football, dart board (but please bring your own darts) and a wall mounted TV. Cleaning / Towels / Linen / Maid service: Penamont is provided with fresh white linen and luxurious towels. For 2 week bookings, the house is cleaned and the linen and towels changed every week. 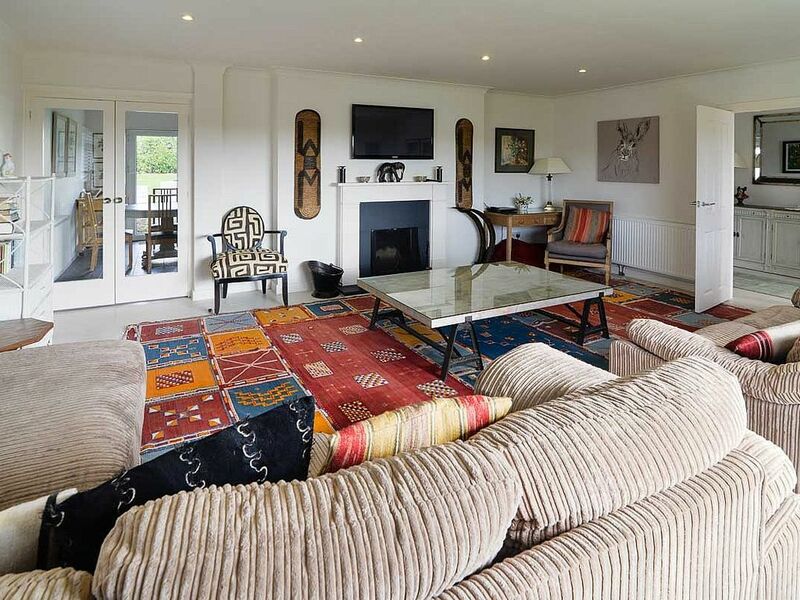 Other: New for 2013 – games room in the garden, with pool table, TV and bean bags – get some peace and quiet in the house! Constantine Bay is centred in an area renowned for great surfing. The 5 or 6 beaches in the immediate area offer a great range of surfing suitable for all weather conditions. The beach at Constantine Bay is just 10 minutes walk away. Its a fantastic beach for surfing, swimming and sunbathing. Its huge, with plenty of space along the dune fringed sand to relax. Walking is amazing in both directions along the coast path. Treyarnon Bay is just next door, and Booby's Bay can be found at the north end of Constantine. There are also a multitude of other beautiful nearby beaches - Harlyn Bay, Mother Ivy's Bay, Trevone Bay and Porthcothan Bay are all within 15 minutes drive. Driving via the M5 and the A30 - being about 2 hours and 30 minutes from Bristol. Newquay airport is about 10 or 15 minutes drive away - with plenty of flights now available from around UK. Padstow is 5 minutes drive away, while Newquay is about 25 minutes drive. Rock and Polzeath can be driven to in about 30 minutes - or you can take the ferry across from Padstow. St Ives with its fantastic art galleries and beaches is just 50 minutes away. Changeover Day: Penamont's changeover day is Thursday - with arrival by 4pm in the evening and departure by 10am. At half-terms, Easter, and Christmas/New Year we can be flexible with the changeover day, so please enquire.